Six warning signs your child is being bullied. Approximately 160,000 children miss school every day in the United States for fear of being bullied. More than 50 suicides have been linked to prolonged bullying. Approximately 85 percent of school shootings have revenge against bullies as a major motive. School-related bullying has led to depression and poor school performance in many children. The costs of bullying are high, but, unfortunately, many children suffer alone, keeping their experiences of being bullied to themselves. Many kids are taught that it is a sign of weakness to ask for help and frequently fail to tell anyone when they are being bullied for fear of appearing weak. They feel shame and think, Something must be wrong with me. Why else would they target me? Students who are bullied are at risk for developing a number of emotional difficulties, including depression and anxiety symptoms. Those who are particularly traumatized may go on to develop a specific type of anxiety disorder, called post-traumatic stress disorder (PTSD). PTSD is usually brought on by a terrifying physical or emotional event or series of events. Some of the symptoms of PTSD include trouble sleeping, withdrawal from normal activities, a lack of concentration, and emotional numbness. PTSD can lead to physical symptoms in situations where kids feel unsafe and in danger. They appear disconnected from others and may experience an intense physical response from their nervous system that can involve angry outbursts, jumpiness, and hyper alertness. Whether real or imagined, this reaction is the nervous system’s response to potential danger, creating constriction and disassociation in order to protect the body. When children experience trauma, they often become frozen and exhibit feelings of helplessness and shame, rendering them nearly unable to defend themselves when attacked or put under pressure. These traumatized children then bring this frozen state of helplessness to many other situations that they perceive as threatening throughout their lives. And, the more withdrawn these children become, the more fearful and helpless they feel, the stronger the likelihood that they will slip into serious emotional trouble. Although children may experience depression, severe anxiety, or PTSD due to a variety of factors, frequently these symptoms are related to school bullying. 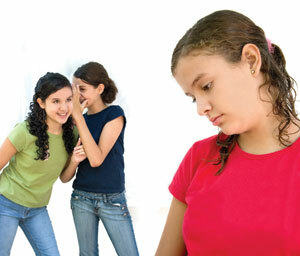 The following is a list of red flags that your child may be being bullied. Is your child disconnecting from people and isolating himself? Has your child developed physical problems, such as stomachaches and headaches that interfere with daily life? Has your child’s schoolwork recently suffered, or is it difficult for him to concentrate? Does your child have trouble falling or staying asleep or experience frequent nightmares? Does your child seem listless, unenthusiastic and disinterested in life? Have you noticed that your child seems hyper-vigilant, extremely nervous, depressed, or emotionally explosive (beyond the normal teenage angst and moodiness)? If you suspect that your child is suffering from any of the above symptoms, you should consider having your child evaluated by a licensed psychologist, licensed marriage and family counselor, or licensed social worker. If you can’t afford to pay for private therapy sessions, virtually all cities have low-cost therapy clinics (check with your city or county department of mental health). About the author Ted Zeff, Ph.D.
Ted Zeff, Ph.D., is the author of Raise an Emotionally Healthy Boy: Save Your Son from the Violent Boy Culture (Prana Publishing), which may be purchased at www.amazon.com. For more information, visit www.drtedzeff.com.